"With what can we compare the kingdom of God, or what parable shall we use for it?" I,Robot -- What Is Your Purpose? Bruce Wayne is paralyzed by his fear until he learns to master it. He learns to redirect his dreaded experience with bats so anyone who preyed on the innocent would have a similarly dreaded experience. Thus Batman Begins (starring Christian Bale) demonstrates how fear can be either advantageous or detrimental, depending on how we react to it. 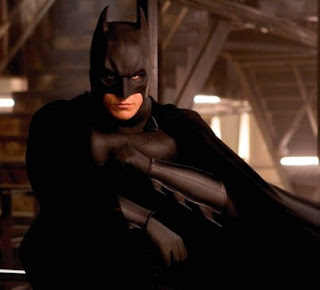 Batman Begins appropriately demonstrates how fear is like a drug. The drug they derived from the rare blue flower amplifies a person’s indwelling fears to an overwhelming degree. People affected by this drug will see their fears swarming around them wherever they look. This is an appropriate demonstration of fear. Whatever we are afraid of follows us around. The things that frighten us wait for us around every corner, affecting our ability to carry out the true desires of our heart. Most people are governed by fear. We wage wars because we’re afraid of what might happen if we didn’t. We vote for the candidate who promises to keep us safe. We don’t seek after our true passions because we’re afraid we might starve in the process. We don’t speak out against wrongdoing because we’re afraid of what people might think of us. Fear is a powerful debilitator. Fear can be useful depending on how we react to it. It can inspire personal growth. We grow up a little more every time we overcome our fears. As a general rule, God honors those who overcome their fears to obey Him. i need to watch more movies! hah! I wonder if we will never escape fear in this life because we'll never attain perfect love-- at least for any length of time. From my own experience, I can say for those very brief periods that I have loved at the very deepest (closest as my little puny heart can manage to perfect) I have been quite without fear... Have you ever had those perfect moments, when it would be o.k. if that was your last moment on Earth? I think the context from 1 John lends a lot to the meaning of "Fear" that John intended. In my reading of the scriptures, I notice that the context seems to answers the question, "Why do we love God?" In chapter 4, the author says, "By this, love is perfected with us, so that we may have confidence in the day of judgment; because as He is, so also are we in this world. There is no fear in love; but perfect love casts out fear, because fear involves punishment, and the one who fears is not perfected in love. We love, because He first loved us." I believe this is intended to say that we love, not out of fear of God's punishment if we don't love, but because of the fact that he loved us first! So, I'm not sure that John is speaking of things like bats, spiders, clowns (yikes! ), etc. That type of innate will always be around, and it is true that we should not let those things dominate our thoughts. But fear - fear of what tomorrow brings...fear of our future...fear as expressed in the context of the passage quoted - is something that we should be able to live without, in complete assurance that we love the Lord with the same kind of love with which he first loved us. Kogmedia.com is a blog by Patrick Roberts. "The time is fulfilled, and the kingdom of God is at hand; repent and believe in the gospel." Movie, song and book quotations are copyrighted by their respective owners, used here for commentary only. If you like anything quoted here then support the respective writer/artist by purchasing their stuff. Copyright © 2007-2008 Patrick Roberts. No material on this blog may be reprinted or used without my approval.